Last month I met some friends for breakfast at a local cafe. As a self-proclaimed pancake luver I decided to try the Dutch Apple Pancakes with sauteed apples. I was unsure with my decision because I am not a fan of the goopy sugary apple pie filling that typically smothers a beautiful stack of flap jacks at the more commercial establishments. I was more than pleasantly surprised when the waiter returned with my order. Our server placed before me three huge pancakes nestled on top of one another each one incorporated with sauteed apple slices and topped with a dollop of lightly whipped cream. They tasted as mouth watering as they looked with a crispy buttery outside and a tender pancake inside. The apple slices were actually cooked in each pancake. A clean simple dish. Pannenkoek is a Dutch pancake that is larger and thinner than the fluffy American pancakes but slightly thicker than crepes. A traditional pannenkoek is about 10-12 inches in diameter and are usually infused with slices of bacon, sausage, fruits or sprinkled with cinnamon sugar. They can be made thinner and rolled up like a crepe or eaten like a pancake with an endless combination of fillings and toppings from salmon to pizza to sweet. We took our regular pancake recipe and thinned it out with a little more milk and butter. You can choose to saute the apples in a little butter and cinnamon sugar beforehand or use thinly sliced raw apples. Add sliced almonds or chopped pecans for an nice variation. Sift the flour, sugar, baking powder and salt. Whisk in eggs and half the milk until thickened. Add the rest of the milk to make a thin batter. Whisk in the melted butter. Mix until smooth. Spray or heat a little butter or vegetable oil in a skillet over medium-low heat. Pour in the batter to make desired sized pancakes. 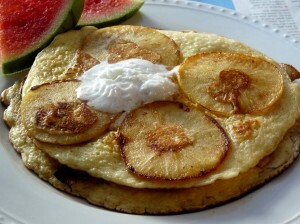 Immediately arrange the apple slices on top of the pancakes. Generously dust with cinnamon sugar. When tops start to set with bubbles flip over. Continue to cook 30 seconds to 1 minute more until bottoms are slightly browned. Makes 10 large pancakes or 14 small.